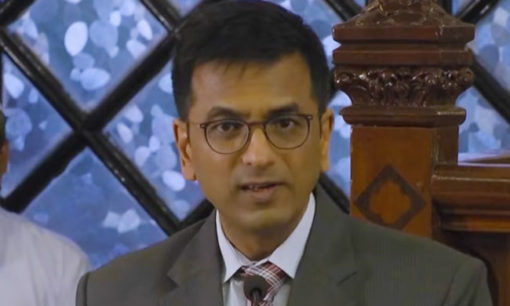 Justice Chandrachud iterated that the more important struggle between the Parliament and the Supreme Court has been over the custody of the Constitution- as to whether the power of amendment is unrestrained- "In the initial days of the birth of the nation, a stronger government tried to drive a socio-political revolution. Immediately, two decisions fuelled the change- the Romesh Thapar case striking down the Madras Maintenance of Public Order Act, and Brij Bhushan v. State of delhi by virtue of which the East Punjab Public Safety Act was struck down" "This was followed by the introduction of the Reasonable restrictions in 19(2) on the grounds of public order, friendly relations with foreign states and incitement to an offence…by the first amendment, Articles 31A and 31B were added which saved the laws providing for acquisition of estates for being inconsistent with the Fundamental Rights…this was the Centre's struggle to centralise power through the Constitution"
"During the framing of the Constitution, a significant question arose as to whether religious and other groups should have distinct representation in the electoral process. The Government of India Act envisaged communal representation in electorates, which idea was rejected by the minorities sub-committee and the advisory committee. The concept was finally done away with by Article 325. The charter of Fundamental Rights begins with non-discrimination on account of religion, race or caste…the Assembly granted autonomy to religious minorities…secularism was finally assigned the value of a basic feature of the Constitution by the Supreme Court in S. R. Bommai" The judge highlighted the asymmetric federalism- how right through the 1970s, one is impressed by the accumulation of power at the Centre, while post 1990, the growth of regional parties and the acknowledgment of the aspirations of the states by the Supreme Court brought about a degree of decentralisation. Speaking of constitutional identity, he remarked that homogeneity is the anathema to the Constitution. Constitutional identity is borne not merely from the features and ideals enumerated in its text, but from the relation between the constitution and the culture in which it operates, the gender, religious and national identities.